On my friend David Kanigan’s blog Lead.Learn.Live, he featured an article about Superfoods. These 14 Superfoods are supposed to be “Super Power” for your body. Who does not want to have super power? It is a known fact that our productivity, whether it is at work or home, greatly depends on our health. We have all gone to work when we haven’t felt well and it was hard to produce the amount of work as you normally do when you feel great. Most employers would prefer that employees stay home if they are sick as they have to pay them a full day of wages and their productivity is usually about half (or less) of what it should be for the wages paid. The correlation between being healthy and being productive has been proven in studies time and time again. How can we stay healthy? Eat right, get enough sleep and exercise on a regular basis. Eating right can prove to be a challenge at work when all of your co-workers are stepping out to grab fast food or they bring in donuts to “share” in the morning. 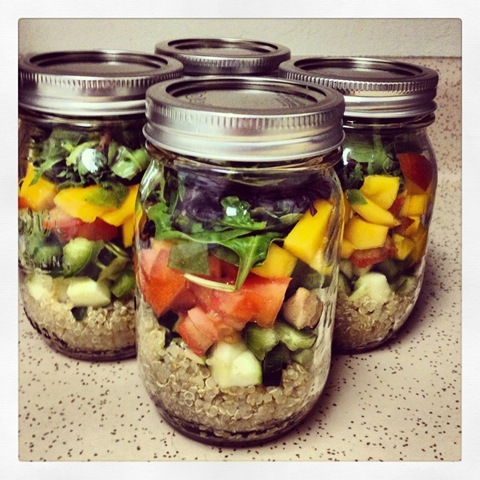 Recently, one of my co-workers began to make healthy meals for himself to bring to work. He takes the time to prepare them on the weekend so he will have the meals during the week, which helps him not to be tempted to eat out. He has goal is to run a marathon this year and he is serious about what he puts in his body. 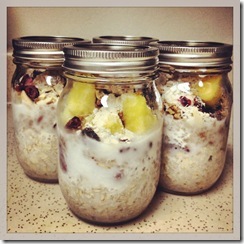 For breakfast he puts oatmeal, fruit, shaved coconut and spices in a jar. He then adds almond milk or coconut water to it the night before. 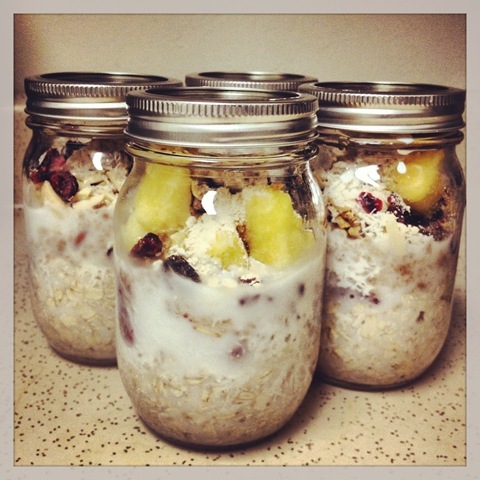 In the morning he has a great jar of cold or hot cereal to eat. As you can see from the picture at the top he also makes fresh salads that he packs in a jar. He puts quinoa and the dressing at the bottom and then packs the veggies and greens on top of it. Not only is this healthy for his body, but his mind is sharper than if he ate French toast with syrup for breakfast and a Big Mac for lunch. 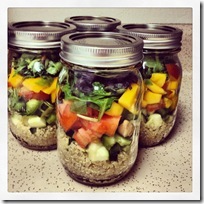 By making his “jar meals” in advance he is more likely to be disciplined to eat what he has pre-prepared. That age-old saying “we are what we eat” is true. Take some time to think about how you can eat healthier and be creative like my co-worker. Your body and employer will thank you for it! This entry was posted on Tuesday, July 21st, 2015 at 8:00 am by Tina Del Buono, PMAC.